For a detailed overview of this movie, click here. 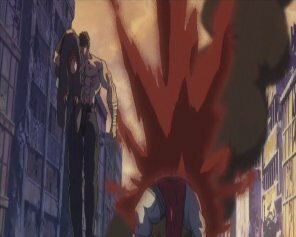 Kenshiro has been badly beaten by Shin, will he recover? 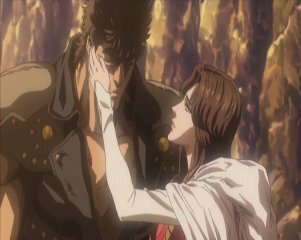 Having defeated Raoh, Kenshiro takes Yuria to a place next to a sea, saying that he wanted to marry her here. Yuria says they should still get married now, and the two have a ceremony in a church. Later on, the two head back out of the church to watch the sunset. However Yuria is still sick and is going to die eventually. She suddenly coughs and as Ken comes to her aid, he says he wishes there was something he could do to fight her illness. Yuria tells him not to be sad but to instead tell her about the journey he had to go on to find her. However, she says that she isn't the only one who will listen, and she puts Kenshiro's hand on her stomach and he can feel a heartbeat: Yuria is pregnant! She says that his voice will surely be heard and his legacy of being the savior will be passed down. Kenshiro tells her a story. After Shin had defeated him, he was found by a family, who were going to take him back to their village. However, before they could, they were all captured by Guruma and his men. 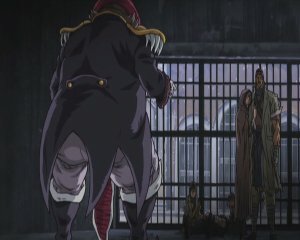 Guruma is a slave trader, who takes them back to his place. Guruma lives in a city called Gesso. 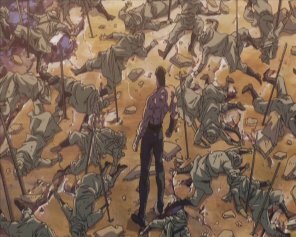 It is a city which thrives off the trading of slaves, and the still unconscious Kenshiro is put in a cell with the family who found him. The family consists of Yaman and his wife Saya, and their two children, Danne and Amo. 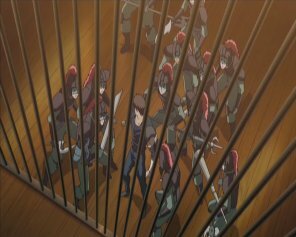 They are also sharing a cell with Fugen, an old man who has badly injured legs. 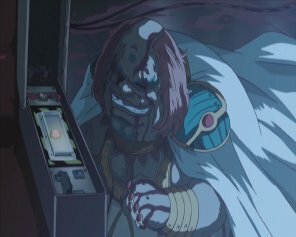 Guruma is called before Siska, the man in charge of Gesso City, and is told he must pay back what he owes him -or he will lose his shop. Ken wakes up after having a nightmare about Shin defeating him, and is introduced to the family who found him. The next morning, Guruma meets up with Jinia, a rival slave trader. Jinia sees that Guruma is trying to advertise Kenshiro as being a powerful warrior for sale, so he comes up with a challenge: he has his own powerful warrior for sale, and they should get the two to fight each other so people know which one is really worth buying. 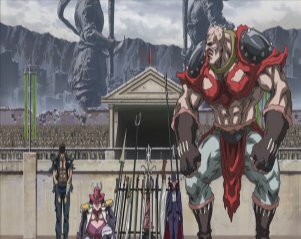 Guruma accepts, but is later worried when it turns out Jinia's warrior is a giant called Gadess, and the fight will take place in an arena where a large crowd has gathered to watch. 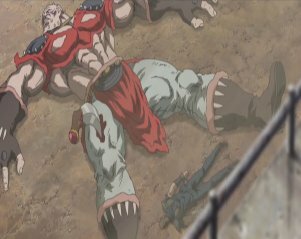 However, Kenshiro defeats his opponent, although he passes out seconds later. Later on, Kenshiro arranges it so that if he is sold, the family is also freed. Fugen says it won't change anything, and that Kenshiro is selfish -he did not kill Gadess just because he could not kill Kenshiro. This is despite Gadess could easily kill normal villagers with little effort, so Kenshiro should have ended his life in the arena. 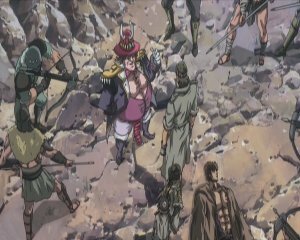 Fugen tells Kenshiro about how the people are waiting for a savior. 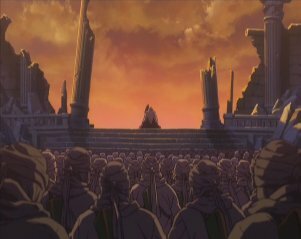 Meanwhile, Jugai, a master of Nanto Koshu Ken (South Star Lone Eagle Fist) gathers together his army. 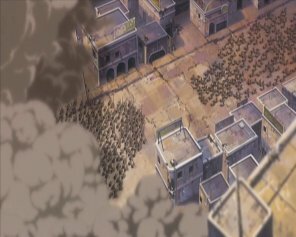 Some of his men have already entered the city, and have stolen one of two detonators which Siska has, so Jugai and his forces move in. They surround the city and soon a siege situation is on. Siska tells everyone to go out and fight -and as he has his men's families locked up in cells, which are rigged with explosives he has the detonator to, they have no choice. The water supply to the village is poisoned, meaning the people inside Gesso City will not last long without fresh water. 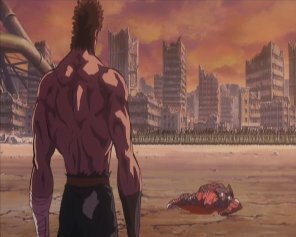 Kenshiro thinks that if he can take down Siska, then the people won't have to fight, they can just get their families and leave. Fugen tries to stop him, as he is not at full strength and cannot hope to use his Hokuto Shinken well. Fugen reveals that he was a Nanto Koshu Ken master, and the one who trained Shin. Once Shin was named as the successor to the Nanto Koshu Ken style, he severed the tendons in Fugen's legs so he could never use it again. Shin then fell victim to his own greed and stole Yuria from Ken. Such events are happening all to often in this new age. But the legend goes that when the stars of Nanto are in disarray, the star of Hokuto appears. He tells Kenshiro that his destiny is to bring this age of violence to an end. He then tells him to leave this place and go on, as he cannot die here. Ken ignores him and attempts to assassinate Siska, but is caught due to him not being fully recovered yet. 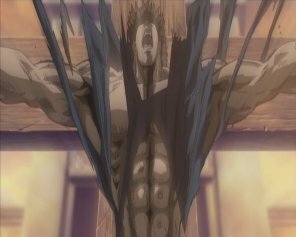 He is chained up to a cross and left to die, as everyone else prepares for battle. Danne goes to Kenshiro and asks him to lend her some of his courage, as she is going to fight. Ken watches her run off, and is distraught, as he knows full well that she and everyone else in the city is going to die. The battle begins, but Jugai's army is larger and it is soon clear who is winning. Guruma dies when he protects Kenshiro from a volley of arrows. Before he passes away, he asks Ken to look for his son, who is with the other hostages, and to give him a pendant he has. 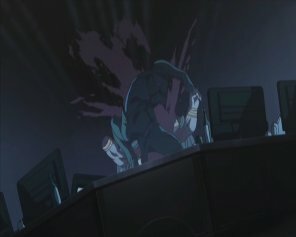 Fugen has also taken a hit, but he says that the heavens are keeping Kenshiro alive, that is why he and Guruma have been taking all of the arrows. Ken thinks about his words...the heavens...are protecting him? 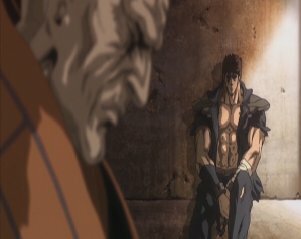 Kenshiro thinks back to the time when he was chosen to become the successor to the Hokuto Shinken style, and something Ryuken told him. He wakes up to the fact that he must become a savior, and blows apart his chains with a new found strength. 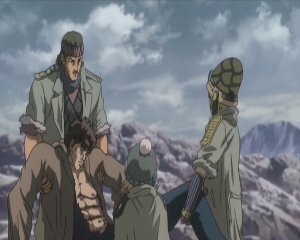 Kenshiro carries the injured Fugen to safety and encounters Gadess, who has joined Jugai's army. Kenshiro kills him by hitting a single pressure point, before taking down many of Jugai's troops. Meanwhile, one of Jugai's men has gone to find Siska, as he wants the other detonator. He finds and kills him, and gets the device. He puts it on a carrier pigeon, which goes back to Jugai. 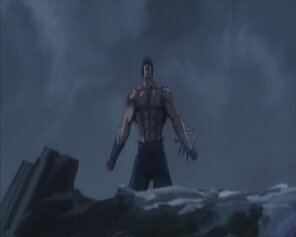 Kenshiro soon finds Jugai, and the two start to fight. 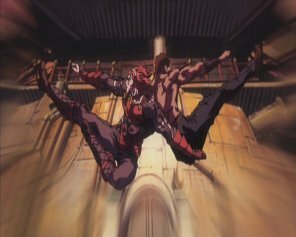 After a short battle, Kenshiro wins by using a rapid punching technique, and Jugai can't understand how he has lost. 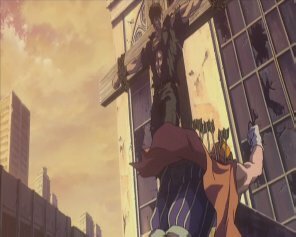 Jugai tosses Kenshiro the other detonator and explains that this city can be his now, and that Siska is dead. He says that Kenshiro doesn't look like he is of evil intent...he wants Ken to show him how far that naive kindness of his can take him. 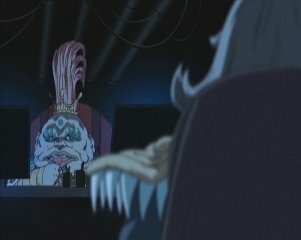 He will be watching from the netherworld. 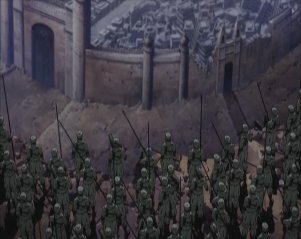 Jugai then dies, and his army run away in fear. 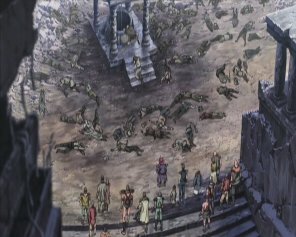 With the battle over, everyone apart from Kenshiro runs to where their families are being held, so they can rescue them. As everyone reunites, it turns out Siska is not dead -and he says that if he cannot have this city, then nobody can! He reveals that there is a third detonator hidden in one of the arm rests of his chair, which he hits and blows apart his entire palace, killing himself and everyone in the dungeons below -including Danne and her family. 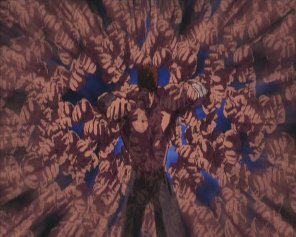 Kenshiro gets up and realises that he is the only one who has survived. He finds Fugen, who just about manages to tell him that he should not cry, and that he must take all of their sadness and engrave it into his heart. They will become his shield as he carries this great burden of sadness. He then tells him to go on and walk down the path of the savior. 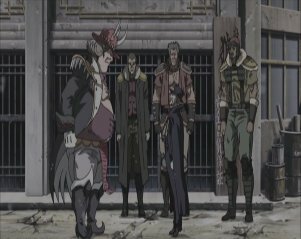 Fugen then dies, leaving Kenshiro alone in the now destroyed city. He takes a look at the pendant that Guruma gave him, and then yells out to the heavens. -A special event was held to promote the film. 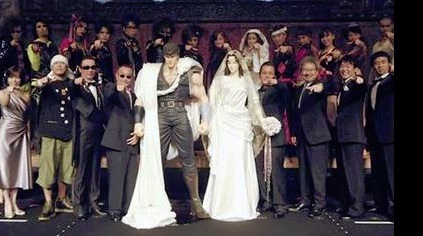 On September 13th 2008, a fake marriage ceremony was held to show Kenshiro and Yuria getting married, and many fans attended it. The date of the wedding, September 13th, was the same day that the first chapter of the manga was published back in 1983. 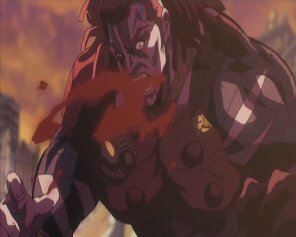 -Many of the voice actors in the film had worked on Hokuto no Ken projects before. Examples include Keiichi Nanba, who voices Yaman in this, previously voiced Bat in HnK 2. Saya is voiced by Miina Tominaga, who voiced Lin in HnK 2. Fugen is voiced by Takeshi Aono, who voiced Rihaku. Danne's voice actor, Romi Paku, voiced Bista in Shin HnK. 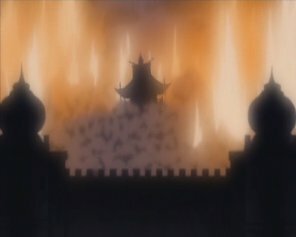 -Juuza of the Clouds appears as one of the spirits near the start, despite being a no-show in the second Raoh movie. Some fans think that this film takes place in a separate continuity than the other Legend movies because of this.